As I write this I am reminded it is only 56 days until Christmas. Certainly many people may have started their planning for the event. The Christmas cake may be soaking in sherry, the pudding made, you may even have ordered your turkey- or bought present. Certainly I have read in the press in the last few days of people who have already decorated the outsides of their homes! So before major panic sets in, have you looked at your guest bedroom? Perhaps you are lucky, or unlucky, to have guests staying for a few days over the Christmas period. Is the room looking its best? Quite often the guest bedroom door is only opened when there are visitors. A fresh duvet cover and sheets are always pleasant. The smell of newly laundered bedding really does help people to sleep more comfortably in what is not their own bed. An inexpensive throw and a few cushions add that little bit of luxury. Have a look at the bedside lamps. They often carry a lot of dust, and it is easy enough usually to replace shades if they are showing signs of fading. If there are young children staying in the room is it worth considering adding some loose blackout linings to the existing curtains? Maybe the ensuite tiling, or your own main bathroom tiling, is looking a little grubby. There is no reason to painstainkingly regrout when you can cover the tiles with inexpensive sheets which mimic the effect of tiles and grout. These sheets can be fixed directly over existing tiles and are completely watertight. Some of the homes around here have little sinks still fitted in bedrooms. 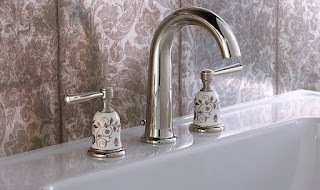 Why not try changing the dull chrome taps for something like these from Samuel Heath. They really do add that little touch of luxury and look so much nicer. 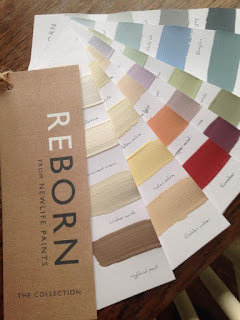 If there is no denying that the room does need redecorating, then think about using a great eco alternative paint from Reborn. They have a great selection of colours, and you will be preventing paint ending up in landfill. The coverage is excellent. Do check out their website and support this great initiative. It is always thoughtful to have a small bottle of water and a glass by the bedside. Many visitors feel uncomfortable about moving around someone else's home in the middle of the night searching for a glass of water. A clean towel in the room and you are done. Once your visitors are relaxed, you can relax too.